Discussion in 'General Role Play Discussion' started by Satoren, Sep 14, 2010. To better promote the use of the RP discussion boards, I thought we might try out something interesting. 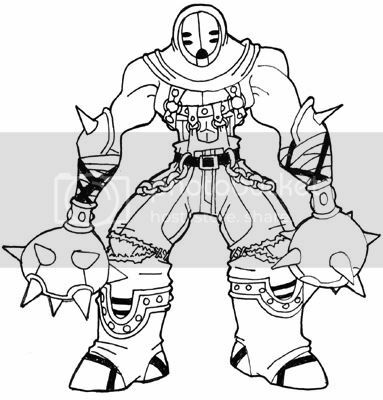 What if we were to have a Pokecharms-themed RP in the style of The Subspace Emissary from Super Smash Bros. Brawl? Here are a few unique points about such an RP. Much like the original SSE, this RP will not have any dialogue from any of the characters. This way, RPers will have to read the details closely so that they have an idea of what to do or how to react to certain events. Also, if there are any other interactions a character might have between his/her environment and/or the cast, they can discuss that here, and bring a bit more life into these boards. Characters come and go as they please, sometimes taking the RP's momentum with them. Because of this, it'd be more ideal to break the main plot into smaller stories and RP each individually. When a portion is finished, that RP is closed and the episode is complete; thereby allowing characters to RP in the next episode without having to scroll back through dozens of posts to look for obscure details. Through this, characters can be introduced or taken out while the RP is still ongoing. Its especially ideal if a character suddenly decides to give up the ghost and quit the RP, or if a new character would like to join the RP though he/she lacks a backstory or any coherence to the previous episode. During the brief intermission between episodes, one can say that characters have simply left and while others joined in his/her stead, offering little to no needless explanations that only confuse the RPers. To give a certain goal for characters to complete the plot of the RP, each episode will have a boss at the end that the players can do battle with. Similar to SSE, we can have several different bosses, each a creation of the RPers. It gives the RPers a chance to formally introduce something of their own design into the plot without having to worry about retcons, plot holes and general inaccuracies. Well, that's about all I got for now. Once I know this idea was received fairly well, I will begin discussing the actual plot. About that bit about splitting each section, or as I'll say, group, should it be necessary to create a whole sub-board in the RP thread for it? Provided there are enough people, of course. And knowing the many failed lovely Charms RP in the past, I'd say quite a lot of people of varying abilities will be interested. Overall though, I think it's a lovely idea! Except, I'm not sure how having two groups of people meeting up would work out, even if it was only for a bit. Do they post in both topics, or just their own, and the RPers involved would have to review both? I'd say that the idea is awesome, but like Tangrow said, it will probably grow very cluttered, whether or not we split it into several topics. However, if the different groups met and stayed together/split up in a planned episode, it would eliminate the problem Tangrow brought up about meeting groups over two RPs. I'd suggest everyone being involved in the first 'pilot' episode of this epic RP, and then split into the different groups as we move on to subsequent episodes, and maybe a "master thread" which basically sums up the events of the different episodes, and the wherabouts of the different characters, so that people don't have to hop between threads to keep up with everything. Most of this will probably come to us pretty soon, so I'm keeping my eyes open and my fingers ready for the moment we begin. If we do make a pilot episode, it should be something akin to either a figthing tourney like in SSBB or one of the Charm festivities, so there's a start. I personally love the idea of a grand 'Charms battle, but like the Fallout RP, it would probably grow way to big. If it's going to happen, we might need to create a new forum board especially for this, to prevent the RP section from filling up. I like Brendan's idea of one single topic that splits into several ones, personally. But that still leaves the problem of a storyline that's good enough for all of those RP's at the same time. We'll also need to come up with bosses and stuff, not to mention making sure that there's a limit to the RP's; If thirty people'd join and they all choose to fight in pairs, we'd have fifteen RP's. This sounds like a pretty awesome idea, though I'm wondering if some characters could be villains. Just like Bowser and Wario joining the side of evil to help change people into trophies, we should have evil characters influencing the flow of the RP as well. Ultimately the characters may have to join together against a greater evil, like in the Subspace Emissiary, but I think it would be a fun idea. If not, then it would be interesting to see who gets paired up into groups to help each other. I find this rather interesting. I quite literally just finished a run through SSE on my friend's Brawl(I don't have it, sadly), and this'll be quite the opportunity to bring RP Shocari back to life. I would like this a lot~ and my little two cents, but I was thinking that the mods/admins could be bosses. Of course, lots of people would disagree on this, so maybe not. One problem I kind of forsee with this is an onslaught of n00bs attempting to RP and failing miserably, amung a few other things that I can't quite put into words atm... (like Soul's tidbit on 30 people joining). I personally think we'll really need to think this through, plot-wise and everything, as well as who joins and whatnot before this idea can really take off. Hm, this might be a little tricky for me due to not having much experience with SSBB. However, I would be happy to play a villain if I got enough information. Secad and Fi can be devious when they want to. Doing the RP in episodes helps to manage the number of RPers. Like in SSE, not everyone was revealed right away. Some of the characters coughSonicursoslowcough didn't even show up until the final boss fight. The plot has to be planned and then we can decide who appears in what episode doing something integral to the plot. It has to be decided beforehand who's appearing in an episode and we have to limit the RPers to that specific group. As for villains, I think it'd be more interesting if we actually had a couple of Charmsians on the antagonist side just to make it fun. A bunch of RPers all choosing the force of good means that we have no one willing to play the villain, resulting in everyone making up random grunts and goons to beat up just to show how badass their own characters are. There's nothgin really wrong with that, but for an antagonistic organization there needs to be a stronger motive and more strategic thinking then just sending out random goons. (what are we, the Mushroom Kingdom?) They don't have to be evil for the sake of being evil; after all, they're antagonists. they're ideals and motives just happen to clash with the protagonists, who aren't necessarily the good guys or have good intentions. I would gladly play a villain. You would have decide how XD But you've got a volunteer. And I know Dwayna mentioned it because she wants to be a villain as well Two volunteers! EDIT: Also, in the original SSE, some of the bad guys eventually joined the good guys, like Ganondorf (who wasn't really evil), Wario, and someone else who I can't quite remember at the moment. Perchance that can happen here as well, so the villains eventually join the protagonists and they aren't totally away from the plot once/if they're defeated? The good thing about this is that our character bios are already in that other SSB thread. You can count me in. I don't really care whether I'm a villain or hero. I'll just see where I end up. I'm probably going to be a hero in the end because we already have quite a few candidates and there were hardly any villains in the SSE. Sem is right, I totally suggested being a villain because I wanted to be a villain myself. I'm not sure what type of motivation I would have, but once the plot is more revealed I should definitely get more ideas. It actually might help if the "antagonists" could duplicate the others, similar to how the shadow bugs in SSE can duplicate a trophied fighter. This could actually serve to cause confusion amongst us, which will make it much easier to get us to fight each other. If we implement this, I'd certainly have myself get captured at some point, and an army of clones cause havoc with everyone else, causing me to be seen as an enemy by pretty much everyone. So we could also use such misunderstandings to pit ourselves against each other. I'd love to join this! I'd prefer to be a hero, but what the hey, being the villain might be fun! 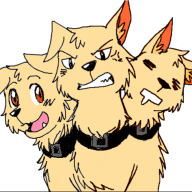 My three Will-O-Wisps could be mini-bosses Like tangrelle/tangrow, and once you defeat them and advance through the Blazi level you meet up with a VERY angry pogeymanz halfer! First you fight regular Blazi, then once you defeat him you fight Blaze-Mode Blazi. He's less human and more pokemon, so now his attacks are stronger, he moves much faster and he's on fire. And to add my addedness, there could be a higher power who 'convinces' regular charmsians to come over to his/her side, convincing while their at their weakest. Like, he could've infected my Will-O-Wisps with some shadow bug things and made them evil, then forced them to attack me and whoever's traveling with me, then when I defeat them I'm heartbroken, and my companion travels on without me. The higher being comes to me while I am grieving and whispers to me about how it's my companions fault for making me fight my Will-O-Wisps, and how I should make them pay. I listen to him and at at the end of my companions treck to the 'boss' they meet a very angry me, turned evil by the suggestion. They defeat me and I turned into a trophy, which is quickly taken back to wherever the 'Suggester' resides. I am powered up and sent back to fight again, this time in his world. I am defeated and finally cured. I help defeat him and Will, O and Wisp are resurrected. Or something like that. Heck, Tangrow could have the exact same situation with Ethan. I'll help with one full boss and Will-O-Wisp before I turn Evil. (And just cause I want to,) Blazikid Joined The Brawl! If Brendan and others agree with this duplication and shadow bugger idea, Ethan's general ability is to manipulate hearts, so it would be easy for him to create a body out of the essence of the heart if he wanted. So if stuff like that is went along with, Ethan would certainly do that, more than likely being led into doing so by other villains through their words (That aren't actually said but this is Brawl and all so s'all good). So Ethan could certainly be the Game and Watch Catalyst type person of this one, if he's fooled into doing so. I definitely agree with the fact that we need some 'charmisons as antagonists. The ones who are antagonists from the very beginning should probably be decided before the RP actually starts so they could perhaps decide what their motives are and what plans they have to fulfill their goal... and whatnot. Suddenly, two ships arrive on the scene; one, an immaculate white, and the other, jet black. Several grunts jump out from both ships and attempt to capture the two Charmsians brawling. At this point, several other Charmsians who were watching from the sidelines can join the fray in an attempt to help their comrades. And then, the first plot twist. From the two ships, several charmsians appear, dressed in uniforms similar to the grunts that were dispensed with earlier. They quickly engage our heroes, subduing some of them (I don't know if we're gonna have people turn into trophies akin to SSB, though.) However, those in black do not seem to be in league with those in white, and they also begin fighting each other. It quickly becomes a 3-way brawl, with the Blacks and Whites fighting each other and trying to capture the regular Charmsians, while the regular Charmsians in turn are just trying to fend off both sides. Outnumbered, out heroes decide to retreat for now and figure out what's going on. As they escape amidst the confusion, they quickly go about Charms, warning everyone of the strange incident while attempting to investigate it. At this point, the RPers can pretty much do whatever they like. However, the antagonist charmsians shold focus on capturing more Charmsians. For as it turns out, the two ships are from two warring factions (if the black and white color schemes didn't tip you offf) They're goal, it seems, is to capture as many Charmsians as they can and brainwash them into fighting for their cause. The remaining charmsians who haven't been brainwashed have to band together and save their friends from the control of these two warring factions, while at the same time ridding their precious forums of this new menace. The Black faction wears masks and have shadow themed abilities, while the White faction (that I have yet to design) will have an immaculate and knightly appearance. Possibly something like white variants of the NOL uniforms from blazblue. Sounds good to me :V I volunteer myself for Team White, since I like their description. I choose team 'Charms! Is it okay, if I'm kidnapped during the fight, but not one of the two brawlers? They can disect me for information ;D. Also, I'm liking the concept art a lot. A traitor or two can spice things up, neh? (or make the plot very cliche depending on how you do it) Or perchance even a double/triple-agent. I totally agree with Shiny Eevee!! We definitely need some double/triple/quadruple/whatever agents. 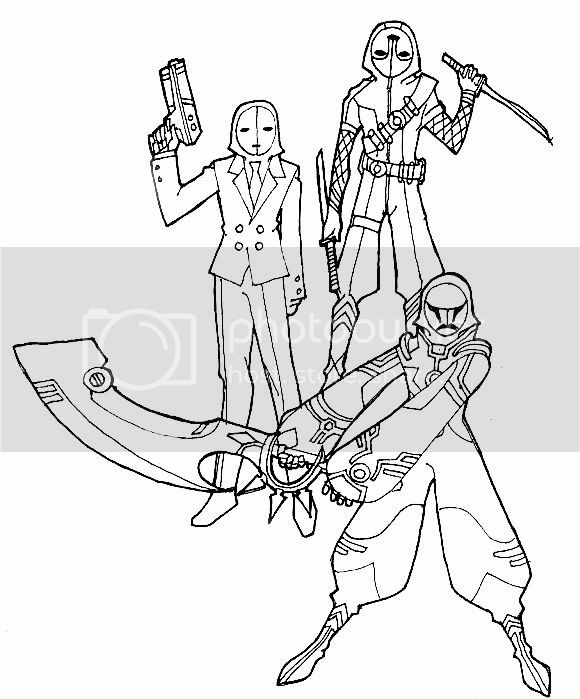 And of course some characters with other motives...some characters who have their own plan. Whatever the team is finally named/designed/whatever, I will be a villain. My motivation would be one of greed and power, but of course, she could settle for a little 'Charms server control to hack in the mainframe and make her all-powerful or something. Thirteen people who have expressed interest. We may need a little more. Or less, I dunno how much are had in mind! Seeing as I am already clad in Shadow Armor, I would really fit into the Team Black style, I think. I'd love it if during the fight, my mask falls of when I'm fighting Toru/Zacky/Dwayna/whatevs, and they'd suddenly recognize me. That would cause a lot of distraction, especially if I am suddenly very agressive and berserk instead of my usual character. I like the idea of two warring factions. Though I can't exactly imagine why. It might make more sense if we knew more about who the Black Bandits and the White Knights were (Like the names?). It's a bit naggy that they both would end up coming at the same time, so one comes first, then the other, would sound slightly better to me. I think that we don't need to be in brawl to be turned into trophies. The traitor Charms members could be equipped with cannons similar to the dark cannon in Brawl that immediately immobilizes whoever gets hit. Not necessarily turning them into trophies, just desk ornaments. Knowing my main character, I'd probably go Soul-Stealer-esque and join Team Black, though I think it would be interesting to be a double/triple agent... and if this does have something to do with the newer versions of PokeMon, I would ally myself with Reshiram regardless. Dragon/Fire legendary FTW. This sounds like an incredibly interesting idea and I'd very much enjoy to take part in it, and it would be fun to play as my "Sir Red" character a bit what with Dwayna RPing in this too. I wouldn't so much be allied with any one side as I would be Dwayna's vessel and simply fighting for whomever I need to. This is shaping up very nicely, RX (and I curse myself for taking so long to see this T-T). I presume you based the black bandits and the white knights off of the new B/W games, so I'd like to offer an idea on ship designs. Since Reshiram and Zekrom have jet engines for tails, we could make the ships similar to the Halberd, except shaped like Reshiram or Zekrom, with a matching jet engine plowing it through the astral. A bit unoriginal I know, but the engines still sound cool. This would answer a mode of transportation through the planetoids for the warring factions, though how Charms members (who are probably a giant jet-powered spaceship short) are going to get around, is beyond me. Also, what would the other planetoids be based on? Video games? Other forums? Something completely original? What do you guys think? This would answer a mode of transportation through the planetoids for the warring factions, though how Charms members (who are probably a giant jet-powered spaceship short) are going to get around, is beyond me. Just a suggestion, but those should be our two modes of transport. People like wario/bowser have the wario bike/clown car. People like Link/Mario have shoes. Well hey, hey, are we actually going to do anything other than sitting around and saying this is a nice idea!? That's fifteen people, guys! And frankly, I don't think we can fit 15 people (Or more) into one topic without explosions all over the place. I'm thinking we could do three topic sets, for those on the white end, the black end, and the good let's save people! end. Provided that these sets clash, I'd suggest that, hurm. Let me give an example. Let's say Dark Soul is in the White thread end, and Dway is in the black thread end, and they encounter each other. Being from different ends, this will likely lead to battle. Let's put in a little plot, that the white members would be escaping from the dark members, and Dark Soul, stopped to hold them off while the white people got more ground. This then leads to a fight, durr. Dark would then jump ship and leap into the topic Dwayna's in, and we'd continue from there! Mind you, he's likely have to say he is in OOC or something, so readers who want to follow, say, Dark's story, know where to look. THe topic-hopping is a bit confusing, but it's better than nothing. Of course, people are going to end up possibly running multiple characters. So I would like to ask everyone: How many people will you be utilizing, and who? If I can get a list of everyone's characters it could help out on who what and where everything is kept track with. I myself, will participate with Ethan, Tangrelle, and Tangrow, who may likely start off in all three different topics, and then end up together in one shortly afterwards. A) Are you still interested in this? B) Who and how many characters will you be utilizing? and C) If we do go with my topic idea (Which I want an opinion or more suggestions on how to split this), which side would you generally stick to? This way, we can get people's preferences all up in there. I personally feel the topic splitting is way too confusing for me... and I think that there might be a better way to do it. Perhaps we only have a few people RPing at a time or something? So, like, two from each group or something as representatives. And once they're done, we move the camera to another scene that's happening at the same time or a little while later or something. So we have Charmsian 1 and Charmsian 2, Black 1 and Black 2, White 1 and White 2, RPing away about them fighting in a tourney or whatever that idea was. That RP closes, and we get a few new people RPing about themselves, say, trying to recruit others/brainwashing Charmsians to join their cause. That one closes, etc. etc. Still somewhat confusing, but I personally feel it's better than topic hopping. As for me, I'm still interested~ And if anything, I would be better off starting as a neutral-ish person (meaning I don't belong in either Team White or Team Black). Possible brainwashing, but eh. And as for interest, yes I am. :3 I'll probably only be using my "Sir Red" character, and I'll be aligned with wherever Dwayna goes (for obvious reasons ). B: Just one, and that' be me. B) Like Dark Soul, it'd just be me. C) I think I'd more than likely end up on Team Black as well, now I think of it, as Tailon the character is already a bit arrogant and aggresive, as well as abrasive for added alliteration.